The Master of Divinity (M.Div.) is a 72­ unit degree that combines academic excellence with spiritual formation and social engagement, to prepare students for service and leadership in many possible settings. The Claremont M.Div. program is informed by the history of thought and practice within Christianity, by exposure to the cultural and religious diversity within Christianity, by dialogue with other religious traditions, and by the quest to understand and respond constructively to the contemporary world. It presupposes that men and women can exercise responsible leadership only when they combine an intimate knowledge of their own traditions, appreciation of other forms of spiritual practice and insight, a deep engagement with today’s social and political realities, and strong dialogical and critical thinking skills. Students in the on­-campus program take most of their courses as semester­ long classes that meet weekly. Six required classes must be taken in the intensive or hybrid mode. Students in the Hybrid/Online program can complete the Master of Divinity degree through a combination of online classes, intensive short-­term courses on campus, and classes that combine intensive classroom sessions and online work. Program requirements and faculty are the same as in the on­-campus Master of Divinity program. The intensive and online formats offer opportunities for students to form relationships, develop community, and engage in deep conversation with peers and professors. To be successful in the hybrid program, students will need a computer (not a tablet), high-speed internet access, comfort with learning and using technology, and good time management skills. The Interfaith Chaplaincy track within the M.Div. degree is designed to meet the needs of those who wish to become scholar­ practitioners in chaplaincy, educated according to the highest standards and eligible to seek professional certification by the Association of Professional Chaplains and other such agencies. Given the frequency with which today’s chaplains are required to engage religious diversity interpersonally and programmatically, it is the purpose of this program to offer an education with two intertwining aspects: a lively and maturing engagement with one’s own tradition and a well-­informed and caringly­ embodied knowledge of religious diversity and interfaith encounter. The Islamic Chaplaincy track maintains the learning outcomes indicated for the Interfaith Chaplaincy track, and is designed to offer greater depth in regards to the Islamic intellectual tradition, Arabic language, and Muslim community dynamics. Students take courses in theological studies, interfaith and cultural competencies, spiritual formation, and chaplaincy/spiritual care. 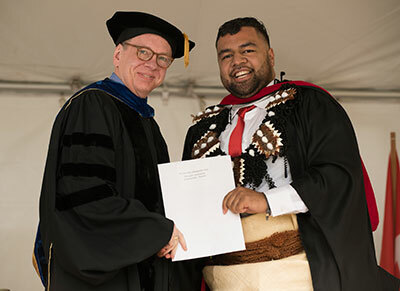 is the first person of Tongan heritage to be ordained in the DOC and is now serving as the lead pastor of the First Tongan Christian Church, co-located with Granger Community Christian Church, in Salt Lake City, Utah. This community is the only Disciples congregation with roots in the island nation of Tonga.